What's there one minute, gone the next, and spends the majority of their time loitering around in chic cafe's situated in San Francisco? No. It isn't Mark Waid or Chris Samnee, silly! Its someone else you'll get to see in this comic book Published by Marvel, in July, 2014. To QUOTE Plato: 'We can easily forgive a child who is afraid of the dark; the real tragedy of life is when men are afraid of the light'. In essence this fairly straight forward story-line is kind of like a three act play. 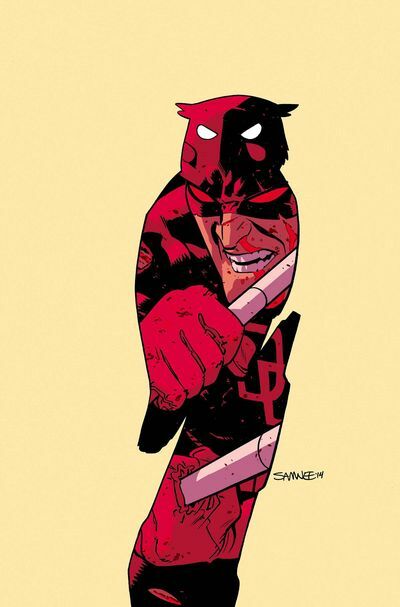 (Act One) Daredevil wants to get his hands on the Owl. (Act Two) But he isn't able to do this because the Shroud has taken him away. And so (Act Three) He has to do what he must to track down the Shroud and finally save the day. Yadda-Yadda-Yadda! Idi Amin. Peace out. The first thing I like to mention about this adventure was how much I loved looking at Chris' amazing artwork. As much as I enjoyed the story, the mood, and the overall tone of this piece, from my point of view there were two amazing looking scenes in it which really stood out from the crowd. 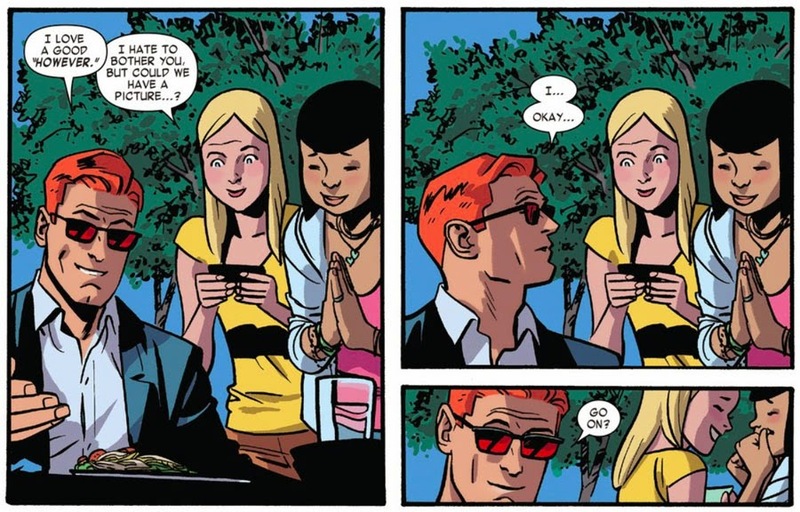 One of them would be that jovial scene where those two girls took a picture of themselves standing next to Matt, even though it didn't really add anything the actual story-line presented. Plus the second scene I got a kick our of would be that fighting sequence where Matt kicked that crap out of those goons, because, well, what's not to like about a mysterious combat scene? Yet for me, personally, the best thing about this entire tale was that part where Matt tried to explain to the Shroud the error of his ways. A part, I might add, that felt even more poignant than the rest, especially when you factor in how Matt put himself into the mix, and explained on a personal level why he thinks the Shroud is taking the wrong paths in life. Last issue I thought Matt categorically proved to the Shroud that his ideas were basically crap ones. So why on Earth did this idiot do the very same thing once again in this issue? Particularly by kidnapping the Owl when he knew Daredevil would be able to handle him better than he could! More or less this tale was about one person being able to see someone else despite the obstacles barring their path. So with that in mind, dear reader, I feel like musically pairing it up with 'The Marshall Tucker Band's' 1973 classic, 'Can't You See'. By now I'm sure you know what I think about that idiot called The Shroud. I think he's an idiot. A damn right silly idiot who acts without thinking things through properly! And so, because of this analogy, a part of me feels compelled to compare this comic to it fabricated yet idiotic equivalent. A crazy quilt. Hey! Don't groan! You know it makes sense. Kind of. Las Vegas -- Sitting by the side of a slot machine and feeding it like a woman possessed. Disney Land -- In the vain attempt to explain to them why they shouldn't turn Yoda into Mickey Mouse's wife. Walmart -- Shopping for a reasonably priced crazy quilt. Cambodia -- As I hear it has fairly nice weather for the time of year. Ebay -- OK. I know this is an on-line shop. But have you seen how much stuff you can buy on there? My God. It can make anyone get lost for months on end. Gotham City -- Trying her best to fit in with Batman and the rest of his crew. Behind the Sofa -- Well, it could happen!